You are here > Home > Adaptive Sports > What is Adaptive Sports or Para Sports? Adaptive sports are competitive or recreational sports for people with disabilities. Adaptive sports often run parallel to typical sport activities. However, they allow modifications necessary for people with disabilities to participate and many sports use a classification system that puts athletes with physical challenges on an even playing field with each other. 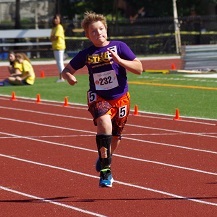 For instance athletes with hemiplegia competing in track events are usually classified T37. The T is for track (F37 is for field events), the 3 represents a cerebral palsy classification and the 7 specifies an athlete with weakness/spasticity on one side of the body. The use of a detailed classification system based on type of disability allows for a more fair competition. For events such as the National Junior Disability Championships (NJDC), qualifying standards are based on age and disability classification. Besides classification, what other modifications might one expect to see at an adaptive sport event? Chalk is used to determine the start point of a long jump for visually impaired athletes, not the toe board. Field implements such as a shot-put, javelin, and discus are generally lighter compared to typical sports. Runners with visual impairments are able to run with a sighted guide. Athletes who use wheelchairs race in specially designed racing chairs and throw from field chairs. Carbon fiber prosthetics and braces may benefit athletes who have limb differences. Archers can shoot at shorter distances compared with typical tournaments, they also shoot at a larger target, and are permitted to use adaptive equipment. Athletes with disabilities may play different versions of the same sports, for instance sled hockey is played by athletes seated in sleds using two sticks with sharp picks on the ends to skate the sled around the ice, and they move with incredible agility and speed! Sitting volleyball is played with all players on the floor, the net is lower, and players must have at least one buttock in contact with the floor whenever they make contact with the ball. 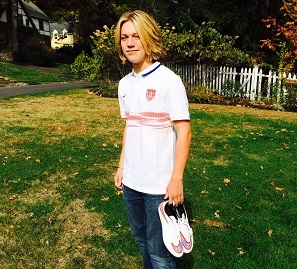 7-A-Side soccer is typically played by athletes with some form of cerebral palsy or other neurological impairments. In this version of soccer, throw ins may be done with one hand, there are no off-sides, and the playing field is smaller. There are many other adaptive sports and many opportunities to participate in them. Skiing, waterskiing, bowling, biking, martial arts etc. etc. There is bound to be something for almost anyone! 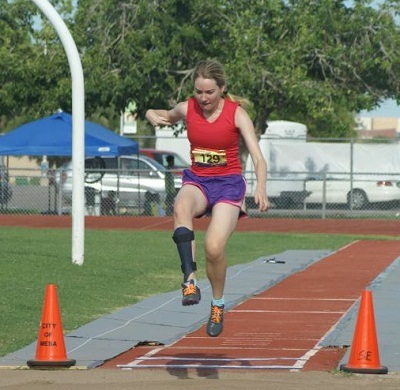 What’s the difference between para sports and Special Olympics? Para sports or adaptive sports are often confused with Special Olympics. Both provide wonderful opportunities for athletes with disabilities but there are some important differences. Special Olympics is an organization dedicated to working with people who have intellectual disabilities. According to their website, “Through the power of sports, people with intellectual disabilities discover new strengths and abilities, skills and success”. These programs are typically not open to individuals who are not identified as having an intellectual disability. Adaptive or para sports include athletes with a variety of disabilities. While adaptive sports was originally created to encompass athletes with physical disabilities, initially only including athletes who used wheelchairs and gradually becoming more inclusive to ambulatory athletes with a disability, athletes with a visual impairment and so on. In recent years, they further broadened their classification system and now many events have classifications for intellectual impairment as well. Interested in getting involved in adaptive sports but aren’t sure where to start? The first step is to discover what might already be happening in your area. On the USA Paralympics website there is a sport club locator which allows you to enter your zip code and all registered clubs nearby will be listed. There are typically fewer adaptive sports opportunities in a region compared to typical sport activities. With adaptive sports, you might have to travel long distances for your child to be able to participate in a sport. It’s also possible that there won’t be a club nearby. If that’s the case, there are still opportunities to participate in many sports as an independent athlete. Wheelchair and Ambulatory Sports USA and Paralympic Sports USA are both excellent resources in terms of finding activities and events locally. Wheelchair and Ambulatory Sports, USA (WASUSA) has a list of sanctioned regional events on their website. See if there is one nearby. There is usually some travel involved to attend meets and events but it’s time well spent. Adaptive sport meets are typically exciting, encouraging and positive events. Everyone is cheering everyone else on, there is so much positivity and excitement, teams take a backseat and crowds go wild for all of the athletes. You’ll need to learn the rules, as they may be different for adaptive sports compared with typical programs. WASUSA’s website has information about the different adaptive sports they cover, including very detailed rule books and explanations on the classification system. For training options when there isn’t a local program nearby, contact local typical sports programs to determine if they would be willing to work with you or your child if you’re the parent. Training and practicing with a typical track and field team, archery organization or swim team and competing at adaptive sports meets may allow the best of both worlds. We are always happy to answer questions and provide support when we can – just ask! CHASA Athletic Scholarships to help with some of the expenses of entering a competition.